Description Ornithine is an amino acid produced in the urea cycle by the splitting off of urea from arginine. It is a central part of the urea cycle, which allows for the disposal of excess nitrogen. L-Ornithine is a precursor of citrulline and arginine. Indication Used for nutritional supplementation, also for treating dietary shortage or imbalance. It has been claimed that ornithine improves athletic performance, has anabolic effects, has wound-healing effects, and is immuno-enhancing. Pharmacology A non-essential and nonprotein amino acid, ornithine is critical for the production of the body's proteins, enzymes and muscle tissue. Ornithine plays a central role in the urea cycle and is important for the disposal of excess nitrogen (ammonia). 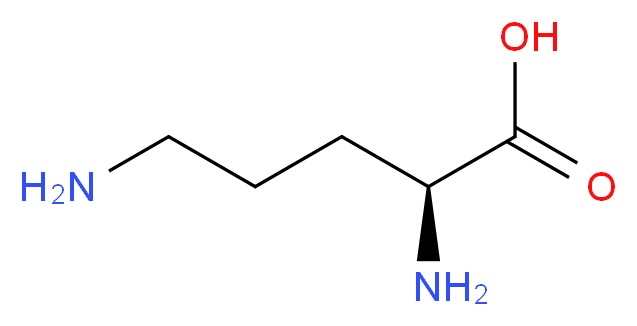 Ornithine is the starting point for the synthesis of many polyamines such as putrescine and spermine. Ornithine supplements are claimed to enhance the release of growth hormone and to burn excess body fat. Ornithine is necessary for proper immune function and good liver function. Biotransformation Ornithine undergoes extensive metabolism in the liver to L-arginine, polyamines, and proline, and several other metabolites.